Why House Renting Market ? It is a trillion market. There are hundreds of millions of people in China who need to rent house for a long time. 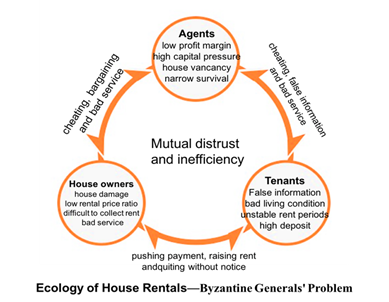 House renting is a global and massive scale distributed business scenario, which combines subdivision of non-standard business behaviors and diversified social network behaviors. The asymmetry of information and complicity of transactions make it hard to build trust in house renting. Trust Credit Power (TCP) combines blockchain technology with industry applications profoundly. TCP is a platform that builds up the industry consensus, reconstruct trust and credit system to provide individuals and business entities with capabilities and authority. House renting is the first industry application scenario for TCP, and the goal is to construct a trustworthy environment for people’s basic needs- living. TCP project will take a double token economic model, which is motivating the establishment of a new set of credit mechanisms to allow the credit value of housing use rights to flow. TCP (Trust Credit Power) token rewards the behavior of uploading real house leasing information. Using the characteristics of blockchain technology, it constructs a set of housing lease credit system based on massive real-world leasing information. House leasing, house leasing financial services, and even all commercial projects that serve service leasing participants can use the real information provided by the TCP system to reduce transaction costs and improve efficiency. TCC (Tenancy Credit Contract) token measures the credit value of a lease contract. TCC generate real value in the rental application scenario and make a strong support for TCP. In other hand, TCC is also a stable trading medium that satisfies the needs of trading circulation. TCP cooperates with Ulink which has shares in 35 leasing operation institutions and has business collaboration with over 300 large scale house leasing enterprises in China. Those institutions manage the various types of properties and providing more than 1.2 million rentable rooms in China. Ulink provides financial services base this network and will be an important and very typical participant in the TCP community and ecology. Due to the supply-side reform of housing in China, the leasing market will be under rapidly expanding stage and there is great potential for future growth. Trust Credit Power will deploy the housing leasing blockchain applications under the help of Elastos. The two will develop the economic ecosystem of house renting together. Trust Credit Power will ensure the authenticity and high efficiency of the distributed leasing transactions through true IDs of all participants in the ecosystem and smart contracts. Large number of users in TCP’s housing ecosystem will be eventually integrated with other applications in Elastos community to build up more trustful living environment. Trust Credit Power will also work with Elastos to develop relevant hardware for smart house and build a secured and efficient Internet.